I’m frequently asked this question for a good reason. Chocolate can be confusing. How’s it made What’s it in? Does all chocolate contain milk? Before I went vegan, milk chocolate was the only chocolate in my life. If you’re a (reformed) sweet tooth like me, the mere mention of chocolate might conjure up thoughts of Hershey’s Kisses or melty Hershey’s bars and toasted marshmallows sandwiched between graham crackers (s’mores!) instead of something on the opposite end of the spectrum, like bitter 70% dark chocolate. Unlike dark chocolate which consists of straight up cocoa powder, cocoa butter, and minimal sugar, milk chocolate is chock-full of milk and sugar. These make the chocolate lighter, sweeter, and more palatable. Perhaps this is why milk chocolate is more popular with chocoholics (at least in the States). Fortunately for us vegans, we have other types of chocolate to choose from! Vegans don’t need to buy specifically branded “vegan” chocolates since true dark chocolate is already vegan. While speciality vegan chocolates tend to be more expensive and more difficult to find, you won’t have any trouble finding an “accidentally” vegan dark chocolate in the regular chocolate section of the grocery store. Be sure to check the label anyway, just in case it’s a dark chocolate imposter. The dark chocolate bars I’ve used contained cacao, cocoa butter, and raw cane sugar. Sometimes they contained vanilla. In my opinion, the fewer ingredients, the better. 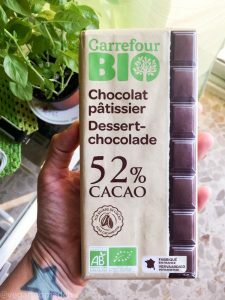 In Torremolinos, my chocolate of choice was Carrefour’s organic dark chocolate. Here in Zagreb, I’ve purchased two bars so far, both from Bio&Bio, an all-organic natural foods store. 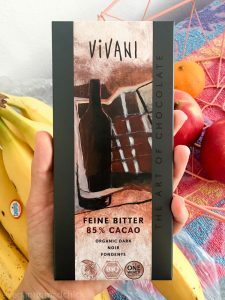 The first bar was an organic 70% dark chocolate by Dennree and my latest bar is an organic 85% dark chocolate by Vivani. (I haven’t opened the Vivani one yet. I’m saving it for chocolate cookies!) 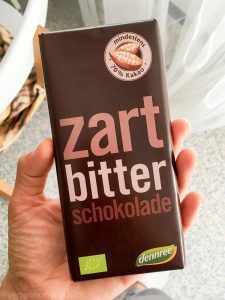 I wasn’t familiar with Dennree as a company (it’s German) but the chocolate is delicious. Even though I don’t eat as many sweets as I used to, a bit of chocolate regularly finds its way into my breakfast. 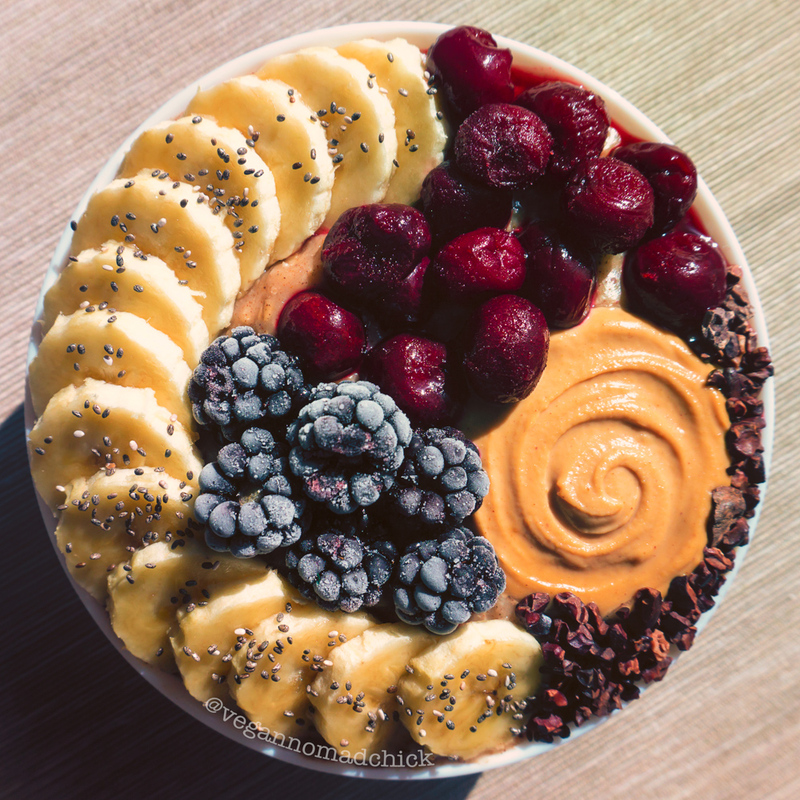 Besides dark chocolate squares melted on top of my oatmeal or a scoop of cocoa powder mixed in as it cooks, I often sprinkle crunchy cacao nibs in between and around the fruit and peanut butter atop my bowl. Cacao nibs, cacao, cocoa…what gives? This is where chocolate gets confusing. All chocolate comes from the seeds of the Theobroma cacao plant. These seeds aka cacao beans are left to ferment, adding to chocolate’s bitter taste. After fermentation, the shell of the bean is removed and crushed into cacao nibs. Cacao powder and cocoa powder are basically the same: the pulverised insides of the beans. These can be used interchangeably in recipes. Sometimes you can find raw versions of these, meaning the beans are left to dry in the sun instead of roasting them at a high heat. This gentler process helps preserve vitamins, minerals, and antioxidants, all of which are naturally present in the raw beans. Basic chocolate bars are made from cacao or cocoa powder, cocoa butter (the fat extracted from the cacao bean), sweeteners, and/or an emulsifier to keep everything together. 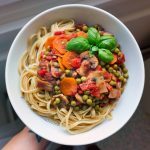 To me, a healthy option is one that contains minimal ingredients and is minimally processed. 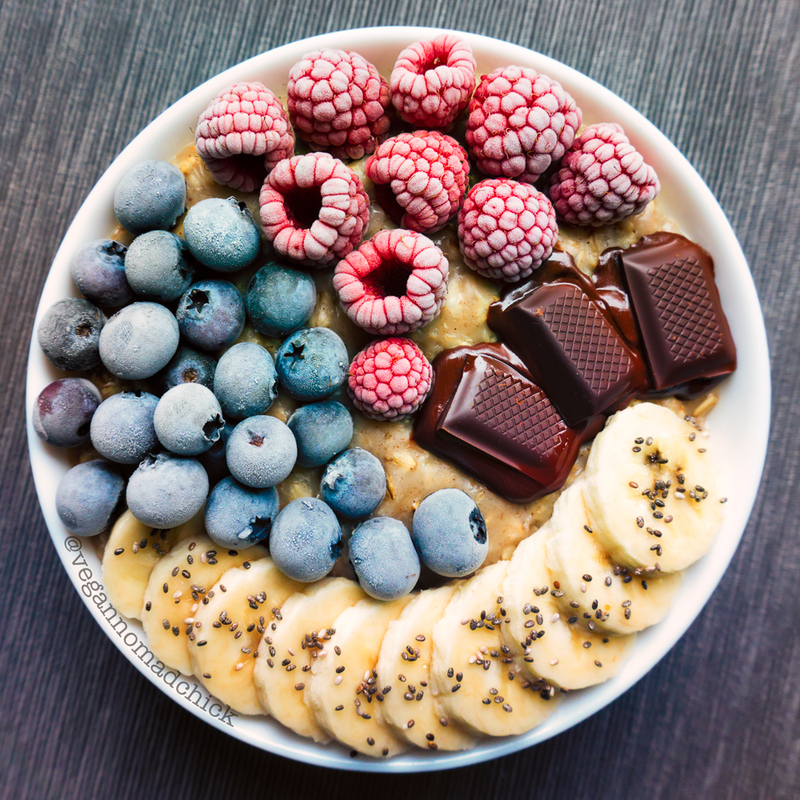 I prefer cacao nibs and cocoa powder over chocolate bars because they are lower in calories, lower in fat, and are minimally processed without any added ingredients. That being said, indulging in a few squares of vegan chocolate per day isn’t unhealthy either. Eat what you like! I really love Solkiki, they are a small company based in Dorset in the UK, they have a direct relationship with all the cocoa producers they use. Some of their bars use rare beans and they are out of this world! Thanks for the recommendation! I see they also do vegan white chocolate. Their flavours sound delicious, especially Tahitian Nougat and Salty Peanut! I’d love to try some!